Dorianne and I went to visit our daughter, Grace, who attends CAP21 (LINK), a musical theater conservatory in Manhattan. During our four night stay, we sampled a few restaurants and had some wine experiences, including setting Grace up with a starter case of wine. The restaurants we chose were generally under the radar – not the high-end, but places that interested us and fit our budget. They were generally reasonably priced, actually a bargain, for New York City, but a couple would be considered expensive in other places. Wine was of course on our minds in making our selections. Here is a brief overview of our experiences. We arrived on Saturday and went to see Grace’s end of the year performance at CAP 21 in the Village. I had made reservations for the three of us and her boyfriend, Kyle, at ŌTTŌ, Mario Batali’s Enoteca and Pizzeria (LINK) on 5th Avenue near Washington Square Park. It was a “meet the parents” dinner, so we wanted something special. While not really expensive, ŌTTŌ is a great experience and has the largest list of Italian Wines that I have ever seen – well over three hundred choices. The three of us arrived before Kyle and we had a glass of wine in the Enoteca in front. We were poured tastes of any by-the-glass wines we wanted before we chose by a very knowledgeable barman. The food was very good in this noisy bustling place. We were seated next to a group of 36 (at two long tables), so that may have affected the noise level. Our wine was a 2011 Soleado Nero d’Avila from Sicily; very tasty – spicy and full-bodied. The service was excellent. I would definitely return. Grace and Kyle Holding Up Pretty Well at the Meet the Parents Dinner. On Sunday, Dorianne was at a workshop at the Brooklyn Conservatory of Music, so after Grace’s Sunday performance, we took the subway over to Park Slope and met her at Cafe Dada (LINK), a funky wine bar with Hungarian ownership. We had dinner reservations later on a few blocks away. Cafe Dada features a number of wines, several from Hungary, so we had a 2014 Peter Benedek Cserszegi Fűszeres, a crisp and refreshing white, with some appetizers. Cserszegi Fűszeres is the varietal (LINK), which was dry with hints of fruit and minerality. It was a bit unusual, but very refreshing. Then it was on to dinner at Rose Water (LINK), on Union Avenue nearby. Our party of 6 included some friends who live in Brooklyn. Rose Water is a tiny little place with a small kitchen just off the entryway. They offer a seasonal menu of locally sourced foods and everything was delicious. The wine list is one of those that is carefully chosen due to minimal storage space – but with a nice selection of wines that fit the menu well. We opted for a 2015 Bonny Doon Vin Gris de Cigare Rosé, since people were getting a variety of dishes. It was a perfect choice (and there were five other rosés on the list). If you are in or near Park Slope, make arrangements to eat at Rose Water. On Monday, we met Grace when classes ended and headed over to Union Square Wines and Spirits (LINK), from the top-ten list of New York Wine Shops in the Village Voice (LINK). As readers of this blog may know, we took Grace to France to taste wines when she graduated from high school. The idea was to educate her palate so that she was not tempted by the cheap, crappy stuff at college parties. It largely worked, and she gets wine as well as any 22-year-old I know. So a mixed case of mid-level wines was selected at this excellent wine shop, she opened an account, and the wine was delivered two days later. I will blog about the idea of a “starter case” and the contents of this one in a future post. Monday’s dinner was just the three of us and we chose Maison Harlem (LINK), just a couple of blocks from Grace’s apartment. The Harlem food scene is really taking off, and this place is near the front of that procession. A funky, laid-back place with definite French accents (including the owners, Samuel Thiam and Romain Bonnans and some of the staff). The food is excellent and the vibe is very friendly. There is a bar in the front that gets very lively, and the dining room in the back with live music on this night – a very competent jazzy trio. The wine list is short but interesting. We had a wonderful meal. The owners were sitting at the next table, so it was a nice experience interacting with them (like one of them showing me his smart phone with my minutes-old Tweet about the place). They also own a wine shop across the street. Except for one thing. Our server brought the wrong wine. I have been on a bit of a Cahors Malbec kick for a few weeks, and they had one on the menu. I ordered it, pointing to the listing as I did so. The wine was brought, but not shown to me, and when given a taste, it tasted very good and looked like a Cahors – dark and inky. But when the bottle was put on the table (I was not shown the label first), it had an all black label, which seemed strange. When I examined it, it was an Argentinian Malbec. By this time the server had gone and the wine tasted fine. When told about it later, he apologized and offered to change the wine, but we decided to keep the wine we were served. Otherwise a great experience; and I could have asked to see the label (but I should not have to). Our final wine-related meal was Tuesday’s lunch. We went to the Amelie Wine Bar (LINK) on West 8th Street, literally a block from ŌTTŌ closing the circle as it were. This little gem of a place offers really tasty food and an eclectic wine list in a mid-Century modern decor. It is very lively at night, there were only a few people there at lunch. There are dozens of wines by the glass, mostly French, but many others as well. We all opted for French wines. The servers are knowledgeable (here, too, most have French accents), and the food was exceptional. I opted for the burger and it was the best I have had in years. There is also a San Francisco branch of Amelie Wine Bar. We closed our visit with a Broadway Show – School of Rock on Tuesday evening, and jsut snacked before the theater. As always, New York is an amazing place with a dazzlingly large array of possibilities. We chose well, I think, and I know that we missed so much. As always, your comments are welcomed. And, if you would follow this blog and share it with others, I would be most appreciative. You can also follow me on Twitter at @JimLockardWine. Last night, we spent some time and had dinner with Brad Kieffer and Karen Oxrider, our good friends and wine buddies. Initially, Karen came over to our house where she and Dorianne did some work for a non-profit they are involved with. 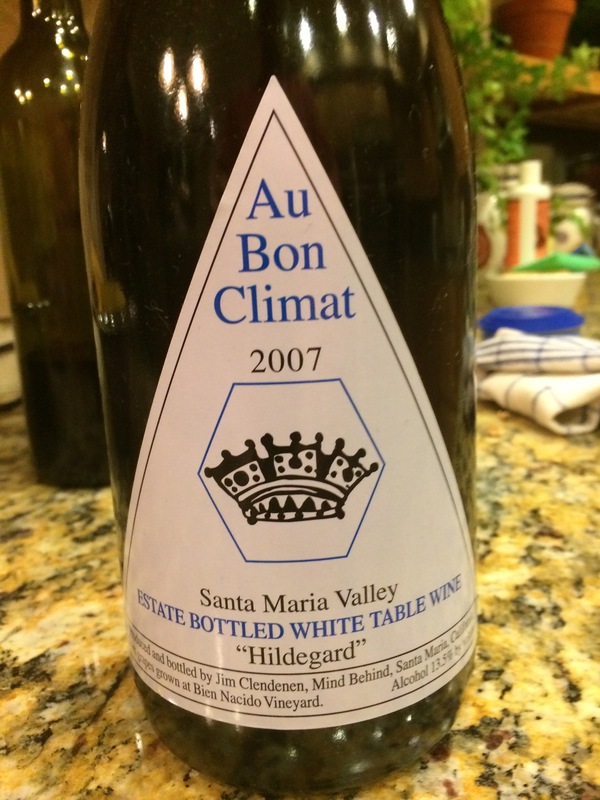 During this time, we opened a bottle of 2007 Au Bon Climat Hildegard White Table Wine, the wine, from the stable of the great Jim Clendenen, is an amazingly well-crafted white wine; made from 55% Pinot Beurot (Pinot Gris), 40% Pinot Blanc and 5% Aligote inspired by the composition of the Corton Charlemagne vineyard in Burgundy as it was believed to have been planted during Charlemagne’s reign as Emperor of the Holy Roman Empire (Parker). I have blogged about this wine before (Link). It made the non-profit work go very smoothly! Unfortunately, it was our last bottle of this great wine. After the work was done, it was time to meet Brad for dinner. We chose Galetto’s Grill in Westlake Village, one of my favorites – a mixture of Brazilian and Italian cuisine with an excellent wine list. But tonight, we would be bringing a couple of bottles. Brad and Karen had a bottle of Hungarian wine that they brought back from a trip to Europe a few years ago. 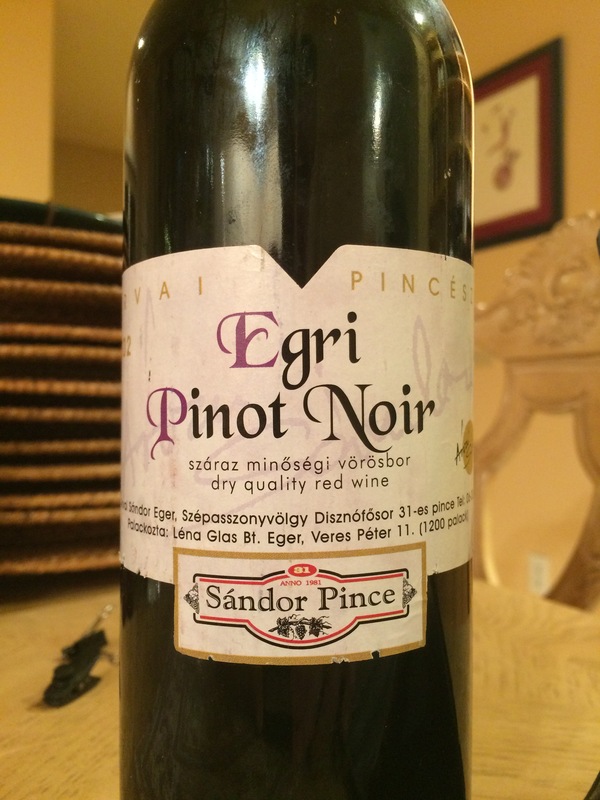 The wine, a 2002 Sandor Pince Egri Pinot Noir, was an unknown quantity. Would it still be good in 2015? Was it a good wine to begin with? An internet search revealed next to nothing about this particular wine. 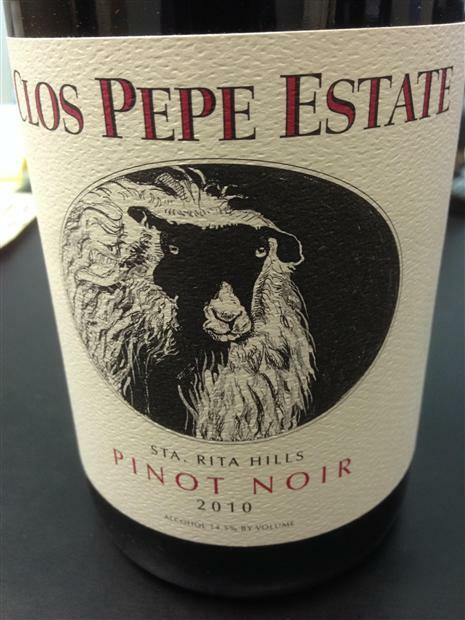 A bottle of 2010 Clos Pepe Estate Pinot Noir would serve as a back-up. Our conversation ranged from travel, past trips and future plans, to wine to food, to our impending move away from California and our extended stay in Europe. It was an evening of good company, good food, and good and interesting wine. The wine was very earthy – mineral on the nose, terroir (dirt) with a hint of rust was evident in the wine – not in an unpleasant way, but there was a nearly total absence of fruit on the nose and in the mouth. I liked the wine more than the others, but I agreed that we should see what it would be like in a few minutes. So we ordered. I ordered a Brazilian style rib eye stake that would come with black beans and rice, pico de gayo, and other spices. Dorianne had a fish dish, Karen had salmon, Brad a skirt steak prepared much like my rib eye. I will say that the Hungarian Pinot Noir was a good compliment to my steak with the dry Brazilian spices. The mineral nature of the wine was a good pairing. It’s relatively high acid and medium tannins went well with the dish. The others were ready to turn to the Clos Pepe, however. As always, the Clos Pepe Pinot Noir did not disappoint. Smooth, with a wonderful balance of mineral and fruit on the nose and the pallet, with a hint of pepper and spice. It was a nice finish to the evening after the harsher Hungarian Pinot Noir. In fact, that wine was book-ended by two splendid wines from the California Central Coast. Our experiment with the rare (for us) Hungarian Wine from the “Valley of the Beautiful Women,” was really not all that dangerous, as we were definitely working with a net, as it were. So it was the best of both worlds – a chance to try something new and also to enjoy two well known wines that never disappoint.